Buy or check out a copy today! The Outsiders, by S.E. 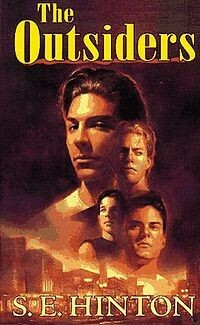 Hinton, centers around a boy named Ponyboy. Ponyboy is trying to figure out who he is and what his place in the world is. His gang, the Greasers, is constantly battling it out with the Soc's, a group of rich kids from the other side of town. Will Ponyboy figure out who he is before it is too late?